The retail/hotel/apartment development Addison Park on Clark will transform the corner of Clark and Addison, if it ever gets built. Courtesy: Solomon Cordwell BuenzView looking south on Clark St. Courtesy: Solomon Cordwell BuenzStreet level on Clark St.
Times have changed. 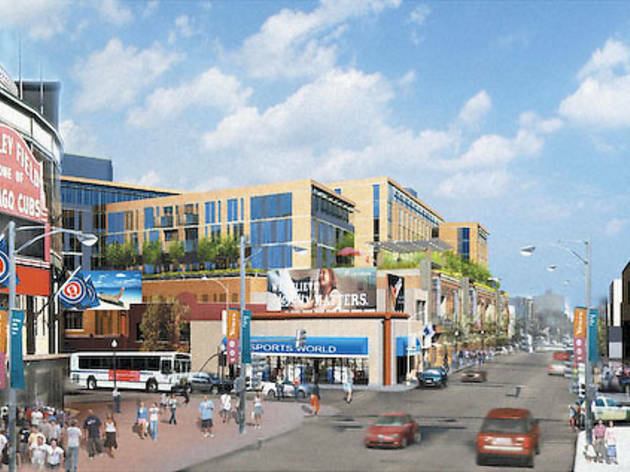 In those days, no one much cared what was being built in Wrigleyville. But the former working-class enclave started booming in the ’80s, during the Harry Caray era. By the ’90s the neighborhood had morphed into the Bourbon Street of the Midwest, a party zone where flocks of unrestrained bachelorette partyers could throw back $5 cans of Bud at Sluggers alongside Cubbie-crazy suburbanites on an afternoon hall pass. 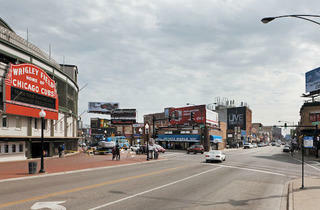 Wrigley Field is now one of the top tourist attractions in Illinois, and real estate in the area sells for a premium. Developer Steven Schultz began snatching up parcels of land in the then-burgeoning entertainment district in the ’80s, eventually purchasing nearly the entire east side of the 3500 block of North Clark and most of the stretch of Addison between Clark and Sheffield. 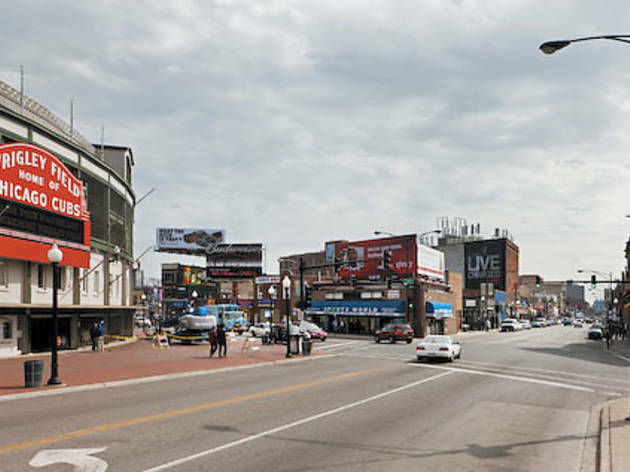 Now, Schultz and his partners hope that will be the footprint for the biggest transformation of the neighborhood since the Friendly Confines opened in 1914. 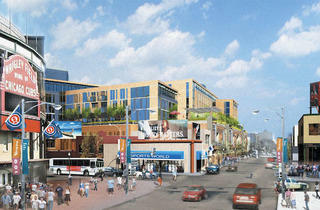 The plan, approved by 44th Ward Ald. Tom Tunney and his Community Directed Development Council (a group representing Lakeview neighborhood organizations and business leaders), passed the City Council last summer without dissent. It calls for 135 apartments averaging 835 square feet each with estimated monthly rents of $1,800–$2,000, 137 hotel rooms and more than 145,000 square feet of retail space. M&R Development, the company overseeing the project on behalf of Schultz, touts its many pluses: 500 jobs created; widened sidewalks; an environmentally friendly LEED Silver–certified design; and a much-needed hotel for Cardinals fans and other visitors. The design has gone through many changes since it was introduced more than three years ago, which Rob Nash, public outreach manager for the project, credits to the more than 30 meetings the development team held with community organizations. In early versions, the hotel tower stood 22 stories tall, dwarfing Wrigley Field; now, the drawings call for the brick- and glass-faced structure to feature an eight-story tower, approximately the same height as the AT&T building immediately to the south. The Clark Street side, originally a monolithic slab, was broken up with what Lahey refers to as “eccentric slots and bays” and differing brick patterns that showcase the individual storefronts. The residents’ requests for parking were granted, to the tune of 399 underground spaces. “I thought they did a good job listening to the community’s concerns,” says Diann Marsalek, president of the Lake View Citizens’ Council. “The most exciting thing, from a business standpoint, is the hotel. There are very few hotels in an area that has very high tourism,” says Bennett Lawson, deputy alderman for the 44th Ward. Lawson points out that, along with Cubs fans during baseball season, the area’s gay and lesbian events draw a half-million people a few weekends a year. “My biggest fear is [the retail portion] winds up being empty,” says Charlie Schmidt, president of the Hawthorne Neighbors, one of four community groups whose areas border the project. “If a Best Buy could work there, more power to ’em. But I don’t know who would go to Best Buy across the street from Cubs Park. I wouldn’t.” Equally distressing to some opponents is the loss of the iconic iO improv theater, Goose Island brewpub and other existing businesses that could be forced out. For his part, Lahey, the architect, is confused by criticism from some local businesses and residents that his design is somehow “suburbanizing” the neighborhood. “What’s suburban about a building that has retail, that defines the street wall and has high-density residential next to an urban-transit stop? That’s about as un-suburban as you can get,” he says. “I can’t give you an expected start time. 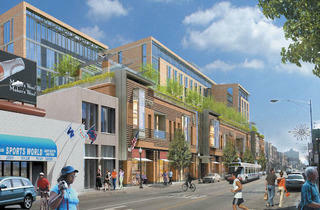 But once the process begins, it’s expected to take 18–24 months to complete,” Nash says. “We don’t anticipate a problem [with financing]; we’ve had a great deal of interest. But obviously the financing has to be worked out. 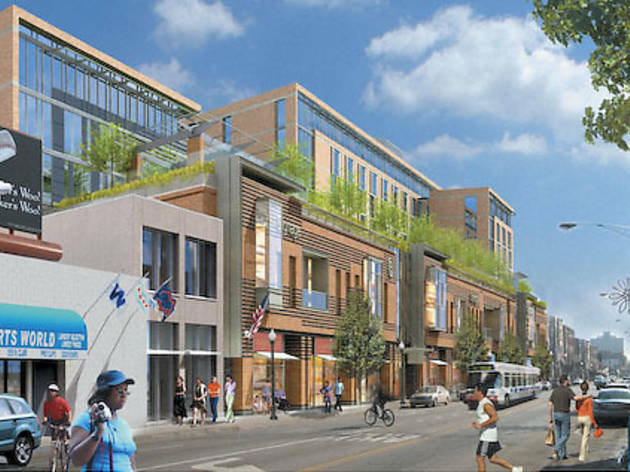 And in today’s economy that is more complicated.” Nash also points out that M&R Development—which is leading the hotel and apartment components—has an equity stake in Addison Park on Clark, which speaks to its commitment. But although Hyatt Corporation is listed as the potential hotel partner on the Addison Park on Clark website, and Nash says Hyatt is still interested in the site, Laurie Cole, Hyatt’s director of corporate communications, says there’s no formal agreement at this point. With ongoing negotiations likely occurring between existing tenants and Schultz, none of the businesses contacted along Clark Street responded to questions about their plans once—and if—the project moves forward. The only business that has confirmed it won’t return is iO. In past reports, Halpern said she was originally told she was going to be included in the new development, but there are no theater spaces in the current plans. Last summer, Halpern said she had her eye on a new location in Lincoln Square, but she now says she’s looking “anywhere and everywhere.” The only place she will not relocate, she says, is the 44th Ward, where she feels Ald. Tunney could’ve gotten more involved on behalf of the affected businesses.